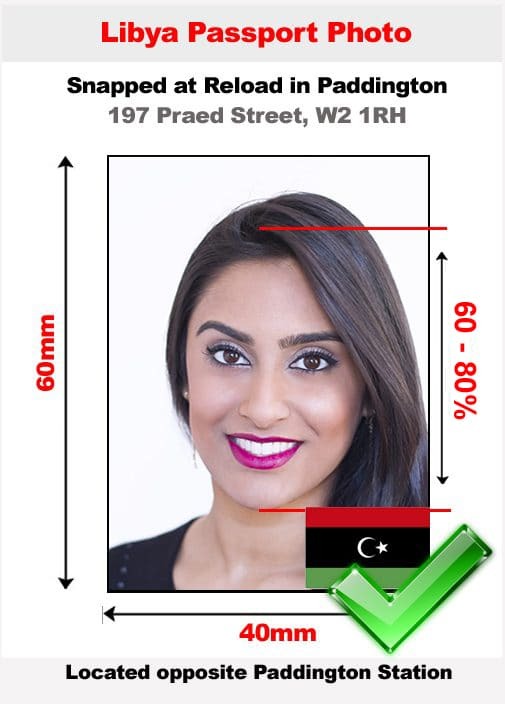 If you live in London and are applying for a Libyan passport or visa, then you will need a Libya passport photo or visa photo. 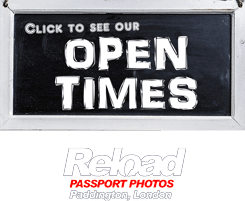 Reload Internet is a professional passport photo studio that specialises in Libyan passport and visa photographs, and is the best place for you to get yours! We have a team of experienced staff that have been trained to provide you with photographs meeting the exact specifications made available by the Embassy of Libya. They will capture, print and prepare you photographs within 10 minutes of your arrival, as we know that carrying out a Libyan passport/visa application is extremely time consuming, so we try to do our best to help. Our store is located in Paddington, London, right next to both Paddington train station and tube station, and we are open every day of the week, from early in the morning until late into the evening. Even on a Sunday we close late at 8pm! This means that we are accessible for everyone in London, and you can come and visit us on a day and time that suits you! Our staff will provide you with a set of 4 high-quality Libya passport photo or visa photo, that meet all of the requirements stated by the Embassy of Libya. We will use the latest camera and printing technology to ensure that your photograph will pass at the Embassy before we even print it off, so you can be secure in knowing that the photo will pass first time. If your Libya passport photo or visa photo does not meet all of the specifications listed below, then it may be rejected at the Embassy of Libya when you submit your passport/visa application. To guarantee that this will not happen, come to Reload Internet for your Libya passport photo or visa photo, and we will get it done correctly the first time! You will need to submit 4 identical photographs. These images need to have a white or an off-white background and must display a close-up of your face. The images must be 60mm x 40mm with a head-size taking up 60 to 80% of the photo. The picture should be from the top of your shoulders and your face should be seen clearly, allowing for visibility of all the features of your face. This means that the image should be taken from a straight-forward position, including the face from the bottom of your chin to the top of your head and each side of the face. You also must ensure that the hairstyle is clear without reducing how much of the face is seen in the image. The images that are chosen, in addition to needing to be recent images, need to have your head directly facing the camera. These images cannot be what are known as portrait-style meaning that your face cannot be tilted at an angle. It is also important that the images have a neutral expression, meaning that you need to have your mouth closed (without your teeth showing) and not in an expression like a smile or a frown. Both of your eyes must also be open. All images must be printed on the best quality image, having a resolution of a minimum of 600 dpi. Your skin color needs to naturally appear in the photos and the color of the image must be neutral. There cannot be any imperfections like creases or folds in the images that are submitted. Photos that have been photo-shopped will not be accepted and the images must be in color. You cannot wear your eye-glasses in your photos unless you can guarantee that there is no glare in the photo. The frame must also not cover your eyes in any way. This is because the eyes must be recognizable. Headwear cannot be worn unless there are medical or religious purposes. 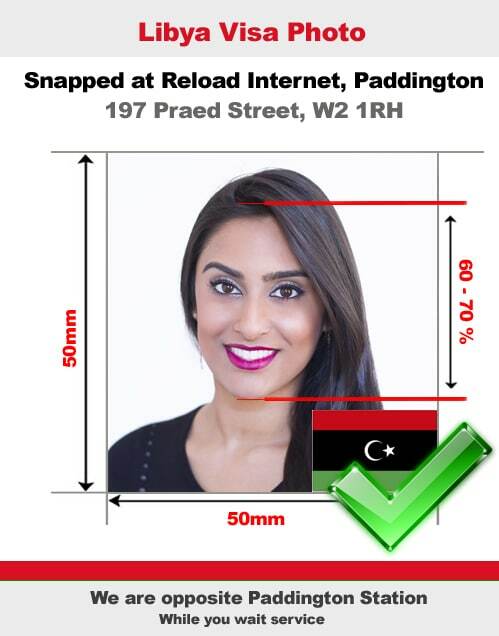 To ensure that your Libya passport photo or visa photo meets all of the criteria above, come to Reload Internet. We guarantee that you photographs will pass with your application the first time! Saving you time, money and stress. The specifications which we have listed above are taken directly from the Embassy of Libya’s guidelines on passport and visa photographs, which you are able to see here.